When you think of a race car, a comfortable and luxurious Lexus won't be the first thing that springs to mind. But Lexus hopes to change your thinking. When Lexus launched its F brand more than 10 years ago with the IS F, some critics believed it could never reach the same heights as BMW M or Mercedes-AMG. Today, the F brand has 60% awareness with consumers, which is right on par with some of the German brands. The Lexus RC F coupe has been around now since 2014 but this 2020 model is the biggest refresh yet. Along with the refresh comes an all-new, limited-run Track Edition model with an increased emphasis on track performance. Lexus flew us out to Thermal Raceway in Palm Springs, California to test the Track Edition in its natural habitat. For the 2020 model year, the RC F sees many of the same changes seen on the 2019 RC facelift. These are subtle, evolutionary updates that Lexus says will emphasize the car's "race-bred functionality.” Up front, the LC-inspired headlights are no longer separated from the day time running lights and the air vents are larger to direct more air into the oil coolers. Lexus has also sculpted the lower portions of the car to provide smoother air flow and enhance high-speed stability. The Track Edtion takes the refresh a step further with a carbon fiber hood, splitter, diffuser, and rear wing, as well as unique 19-inch BBS, forged wheels with red carbon ceramic brake calipers. While we are on the subject of the wing, it is simply massive and has the 'F' emblem weaved in carbon fiber. The standard RC F is available in six colors: Ultra White, Atomic Silver, Caviar, Infrared, Flare Yellow, and Ultrasonic Blue Mica 2.0. If you opt for the Track Edtion, your only color choices are Ultra White, which is a Track Edition exclusive, and Matte Nebula Gray. As before, power comes from a 5.0-liter naturally aspirated V8 mated to an eight-speed automatic transmission driving the rear wheels. For 2020, output has been increased to 472 horsepower and 395 lb-ft of torque (an increase of 5 hp and 6 lb-ft of torque compared to the outgoing car). In addition to the added power, the RC F has gone on a diet losing 55 pounds in standard trim thanks to a new intake manifold, air conditioning compressor, aluminum spring support brackets, hollow half shafts, and various other changes. The Track Edition is a whopping 176 pounds lighter than the previous RC F due to its heavy use of carbon fiber with the carbon ceramic brakes alone resulting in a 48.6-pound reduction in unsprung weight. Lexus also saved 15 pounds at the rear using a Track Edition-exclusive titanium exhaust, which is tuned to deliver a throaty bark and features fetching blue tips. At 3,781 pounds, Lexus says the Track Edition has the best power-to-weight ratio (8.01:1) in its class. With such massive weight savings and newly revised gear ratios, the 2020 RC F is quicker than the outgoing car. A new launch control feature helps the base RC F hit 60 mph in 4.2 seconds while the track edition does the deed in 3.96 seconds. For reference, last year's model could hit 60 mph in around 4.3 seconds. If you care about fuel economy on your sports car, the 2020 RC F is estimated at 16/24/19 mpg city/highway/combined. The V8 is more potent than the current BMW M4 but doesn't produce as much power as the Alfa Romeo Giulia Guadrifoglio or Mercedes-AMG C63 S. Even so, the RC F is the last car in the segment to use a naturally aspirated V8 engine. Only AMG's V8 comes close to matching the RC F's growl. Unlike its turbocharged contemporaries, the RC F Track Edition doesn't pump in any additional sound through the speakers, leaving its beefy titanium exhaust pipes to handle the singing. 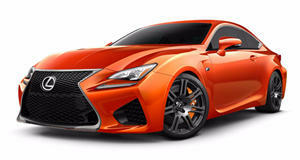 Standard RC F models are available with several different interior colors but Lexus wanted the Track Edition to stand out with a bold Circuit Red leather interior with Alcantara and matching red carbon fiber and carpeting. Anyone who has previously owned an RC F will feel right as the interior features minimal changes, the highlight being the addition of Apple CarPlay for the 2020 model year. In order to save weight, the track-focused model ditches the heated and ventilated seats, the electronic torque vectoring differential, and the powered steering wheel adjustment. Yet Lexus has managed to retain the RC F's civility and luxury. The materials remain top notch and the seats are comfortable and supportive and among our favorite in the industry. Lexus' Enform touchpad infotainment system, on the other hand, could still use some work. While the RC F Track Edition was designed for use on the race track, it hasn't sacrificed practicality in the process. Lexus imagines this as a car you can hammer around the track, then toss in Eco Mode on the drive home. Trunk space remains the same at 10.1 cubic feet, so there's plenty of space for a couple of suitcases if you fancy a weekend away. The Track Edition does have a carbon fiber partition behind the rear seats to provide extra stiffness, so you won't able to fold the rear seats down. Our time spent driving the RC F Track Edition was limited to just a few laps around Thermal Raceway, where we were just able to get a taste of the improvements over a standard RC F. Lexus has taken a deep dive to improve the car's driving dynamics. Some of the small changes include revised steering rack mounting bushings to improve steering response, stiffer subframe bushings to reduce understeer, and stiffer rear engine mounts to eliminate any feeling that the engine is "lagging behind” the chassis during hard cornering. These small changes all add up to increase the RC F's willingness on the track. The old car felt like a heavy Grand Tourer that could feign interest when it was called for track duty but thanks to the weight savings and other improvements, this new car doesn't feel as out of place around corners. Speaking of corners, all 2020 RC F models wear specially-designed Michelin Pilot Sport 4 S tires measuring 255/35R19 up front and 275/35R19 in the rear. Compared to standard PS4S tires, the RC F's rubber has special grooves, a revised shoulder profile, extended bead, and trapezoidal shape. We noticed a tremendous amount of grip on track but wondered if the car would be even quicker with Pilot Sport Cup 2s. Lexus told us it didn't want to sacrifice daily drivability and all-weather stability but we'd like to see owners given the option from the factory. While standard RC F models can be fitted with an optional electronically-controlled limited-slip differential, the Track Edition uses a mechanical Torsen unit. Lexus says it wanted drivers to control the car using the throttle, rather than relying on the computer aid from the differential. For 2020, Lexus reprogrammed the throttle curve to be more linear and responsible than the outgoing car. Combine this with the naturally aspirated V8's willingness to rev and the RC F becomes one of the most immediate-accelerating cars we have ever driven. By the time your brain is finished telling your foot to mash the throttle, it has already been smacked into the seat. Around Thermal Raceway, the additions to the Track Edition made themselves immediately apparent. The downforce from the rear wing kept the car planted through the corners, though we did manage to kick the back out with traction control off using a boot full of mid-corner throttle. Even then, the car felt easy to control and we easily caught the slide. Compared to the M4 CS, which we drove around this same track, the RC F felt nearly as grippy and easier to manage when it stepped out. When it came time to stop, the Track Edition's massive six-piston Brembo calipers with carbon ceramic rotors slowed the car down in a hurry. Some automakers like Porsche have said its carbon ceramic brakes are not the best choice for track use due to their high replacement cost but representatives from Brembo assured us that standard rotors don't provide as capable or efficient stopping power. We found it hard to argue from where we were sitting but don't blame us for the bill if you need to replace those carbon ceramic brakes. If you don't plan to track the car, they should last for thousands of miles. Despite its name, Lexus has given the Track Edition enough luxury and comfort. This is a car built to tackle the track and the nuances of the public road network. We aren't sure how big the market is for livable track cars but perhaps someone out there is looking for a more comfortable track toy. Part of us wishes Lexus had gone a step further, stripping the Track Edition of unnecessary touches like the infotainment system, back seat, electric leather seats, and sound deadening. With further weight savings, the RC F has the potential to be a truly blistering track car akin to the old LFA. The Track Edition still feels precise through the corners, with a nice steering effort and a surprising lack of body roll during weight transfer. For a novice driver with only one garage spot who wants an easy-to-master beginner's car for track days, this may be the perfect fit. When it is time to head home, the Track Edition calms right down and reverts back to being a comfortable GT car. One of the main reasons why you buy a Lexus over an Audi, BMW, or Mercedes is the company's famed reliability. We scoured forums and consumer sites to find any major reliability issues with the RC F and our search came up dry. The only minor issue we found was some odd wear on the seats, which can be prevented through careful upkeep. You may expect a V8 performance car with a 7,100 rpm redline to experience reliability issues but the RC F seems practically immune, with some owners reporting nearly 100,000 miles with only basic maintenance like tire rotations and oil changes. This type of selling point is hard to ignore when cross-shopping an RS, M, or AMG car, which all have costly maintenance and questionable long-term reliability. Pricing for the 2020 RC F starts at $64,750 plus an $800 destination fee. If you want to get your hands on the Track Edition, you'd better act fast. Only 50 cars will be coming to the US split between the white and matte gray cars, while other markets will receive a silver color as well. We received the impression that there may be more coming in the 2021 model year along with some possible color changes. Lexus has told us the RC Track Edition will not be a one-hit-wonder and more Track Edition Models could be in the works - we certainly wouldn't say no to an LC F Track Edition. If you're interested in nabbing one of the 50 cars coming to the US, expect to pay $96,650 not including destination. Yes, this is a significant amount more than a base RC F but its rarity should help the car retain its value more than a standard car. It's also less expensive than the limited edition BMW M4 CS, which starts at $103,100. The Lexus F brand has been around for more than a decade now, starting with the IS F in 2008 and arguably peaking with the LFA in 2011. While the RC F Track Edition can't match the lunacy of the LFA's howling V10 engine, it does capture some of the LFA's magic with a segment-best exhaust note, head-turning looks, and track-ready performance. While we do question why a track-focused car needs to have any creature comforts at all, the 50 people who buy this car may think differently. Most buyers will settle for the standard RC F, which has also been improved greatly over the outgoing car and is more affordable than the Track Editon. Lexus seems to be learning from complaints that the car was too heavy and therefore could not be taken seriously against its rivals from Germany. With this 2020 refresh, Lexus has narrowed the gap and paved a future path for the F Brand.